A Soyuz rocket topped with a Fregat upper stage launches the Venus Express probe into space for the European Space Agency (ESA) on Nov. 8, 2005 EST. It was early morning on Nov. 9 at the probe's Baikonur Cosmodrome, Kazakhstan launch site. A Europeanprobe is bound for the planet Venus on a mission to peel back the shroud of theplanet's thick atmosphere after successfully launching into space atop a Russian rocket. The EuropeanSpace Agency's (ESA) VenusExpress spacecraft rode a Russian-built Soyuz rocket into space at about10:33 p.m. Nov. 8 EST (0333 Nov. 9 GMT), lifting off from Baikonur Cosmodrome inKazakhstan on a 162-day trip to the second planet from the Sun. By 12:13a.m. EST Wednesday, ESA officials said Venus Express had successfully fired theengine of its Fregat upper stage for a final time, sending the probe on aVenus-bound course. The probe later unfurled its solar arrays, ESA officialssaid. "I havegreat expectations for this mission," Venus Express project scientist H?kan Svedhem told SPACE.comin an e-mail interview before launch. "I am sure we will get very exciting dataand perhaps a few surprises." The $260million (220 million Euro) Venus Express probe is the ESA's fastest spacecraftto develop to date, taking less than four years to move from the concept phaseto launch, and its first aimed at Venus. While several probes have swung past theplanet on their way to other bodies in the Solar System, the ESA's VenusExpress is the first dedicated probe to investigate the cloudy world since NASA'sMagellan orbiterburned up in the planet's atmosphere in 1994. "The atmosphereof Venus is so alien compared to Earth, yet it's our sister planet," KevinBaines, a scientist from NASA's Jet Propulsion Laboratory (JPL) participatingin the ESA mission, told SPACE.com before launch. "We've got the samesize, the same materials basically and almost the same gravity." Butsomewhere along the line, Earth's neighbor clouded over with a thick atmosphererich in carbon dioxide, and a surface temperature of averaging about 869degrees Fahrenheit (465 degree Celsius). Researchers believe the planet may beexample of the greenhouse effect run amok, in which the world's atmospheretraps in heat. "Venus hasa lot of lessons to teach the Earth about how things could go awry," said Baines,who is participating on work with two Venus Express' instruments. The 2,733-pound(1240-kilogram) probe carries seven high fidelity instruments - many of whichleftover or derived from previous tools aboard ESA's MarsExpress and Rosettaprobes - to make a detailed study of the planet's atmosphere. While Venus Express' primary goal is to peer close at the Venusianatmosphere, Svedhem and other mission team members are hopeful the spacecraft'sinstruments may find hints of active volcanoes and other features on theplanet's surface. "We shallget detailed images of the dynamic behavior of the atmosphere in threedimensions and spectra telling us the about the various substances in theatmosphere," Svedhem said. "There are so many things that we want to study onVenus and the spacecraft and the instruments are all in excellent condition." Tuesday'slate-night launch - though it was early morning on Nov. 9 at the mission'sKazakh launch site - marked the second attempt to launch Venus Express. Launchofficials missedan initial Oct. 26 launch date after engineers discovered traces of insulationcontamination inside the probe's protective launch fairing. The contaminationforced pad workers to remove Venus Express from its Soyuz-Fregat booster toallow cleaning. 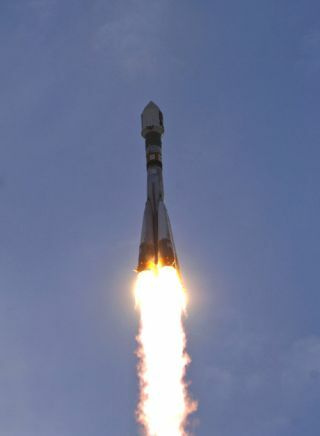 "This Soyuzrocket has proven to be very reliable and it has a very good record," Svedhemadded. ESAofficials expect Venus Express to enter orbit around its target planet on April11 of next year. After a series of passes to adjust its orbit, the probe shouldreach its final flight configuration by about May 7, they added. VenusExpress is slated to spend at least 15 months studying the Venusian atmosphere -which spans about two full days on Venus due to its slow spin rate - though thatterm could be extended in the future, ESA officials said.